Christian turns 19! I'm always in charge of the birthday cake and this year Christian requested apple pie in an oreo crust...uh...what? So I made a Dirt Cake instead. He didn't really get many presents since he's leaving soon but Chris did bring him a treasure box of his old polyester ties with beautiful patterns and designs on them, like a green salad for example. Zander also gave him Spanish scriptures with "Hish" engraved on them. 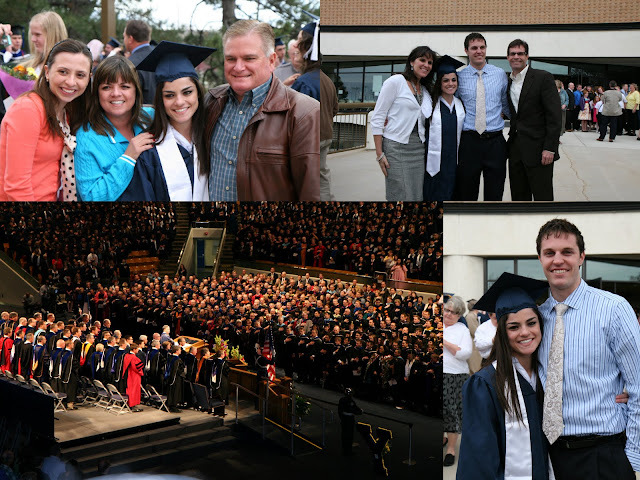 Rebeca graduates! This is the sweetest girl you will ever meet and we are so excited to get to know her and her family! 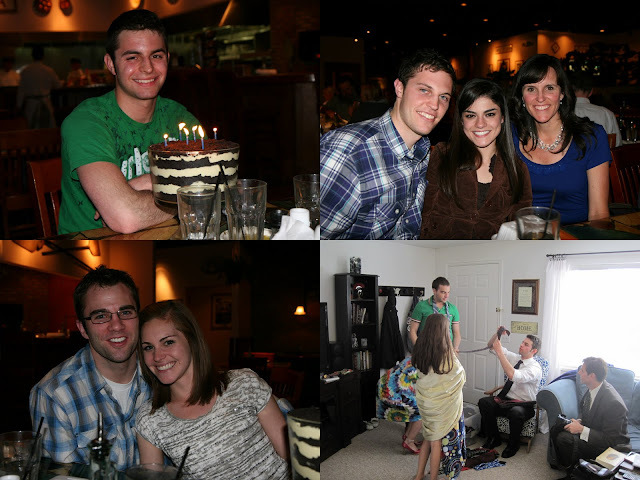 We all went to the Cheesecake factory together to celebrate and they are so much fun. We were one loud party of 17 and we loved it. Congratulations to Sarah and Chad on their engagement! I was so happy to see my best childhood friend get engaged to this gorgeous lady. I first met her at Evan and Chad's inter mural game in September and I thought "oh man I hope he keeps this one," I loved her! And still do ha. They are perfect for each other and we have so much fun with them, we can never stop laughing! 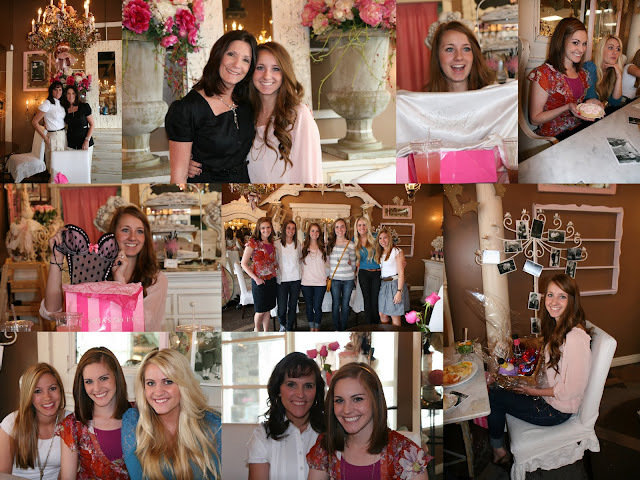 Cheyenne and I threw a little bridal shower to celebrate at Dear Lizzy and we were lucky enough to plan it on a weekend when my mom and Karen could come too. Can't wait for the wedding! 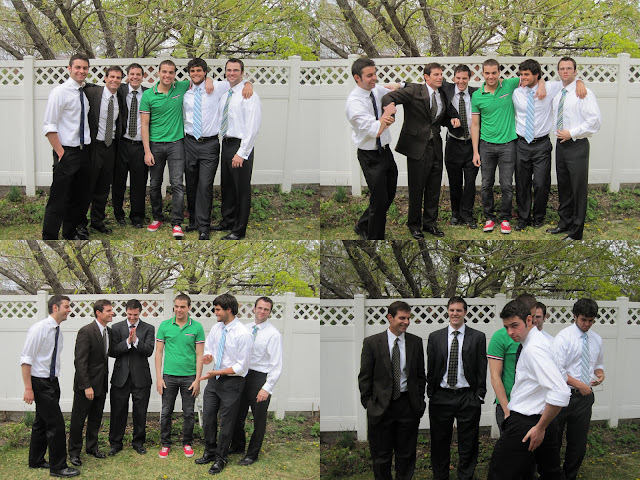 The annual Easter photo shoot... as always the boys struggle. We got it right in one try, thank you. But this is who the weekend was really all about. Evan did an Easter lesson with his seminary class where he filled Easter eggs with symbols of Christ (bread, water, a rock, an olive, etc.) and after the kids found their egg they had to find a scripture to match it and then share the scripture and symbol along with their testimony of Jesus Christ. We did the same thing with my family after Easter dinner and I love the tradition we have started. 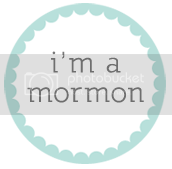 I am so grateful to my Savior for the atonement and for his resurrection, and I am amazed at the love and forgiveness he has for me and there is nothing that brings me more joy or more peace than the gospel. 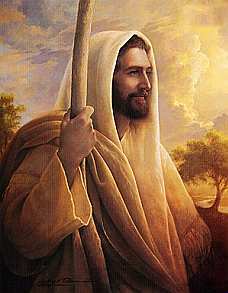 I know He is there to comfort me, to forgive me, and to make my weaknesses into strengths. I know that without Him I am nothing and that with Him I have the potential to become something great. I love the chance we had this weekend to remember the atonement and the resurrection, to remember the wounds in his hands and in his feet, to remember the good that he did while he was here on the earth, and to remember that our Savior is real and that He lives and that it is only through him that we can go home. I like this post...so sweet! I'm glad you had so much fun with your family here! It was good to play while we had the chance. Sure love you! Sarah was one of my favorite EFY girls!!!! So crazy!